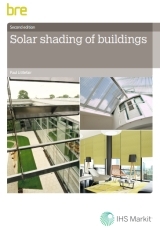 Solar shading of buildings: Second edition (BR 364) was written by Paul Littlefair and published by BRE on 5 January 2018. The careful choice of solar shading for buildings allows good use of winter solar gain and daylighting whilst avoiding summer overheating. This can help reduce cooling costs, prevent glare (particularly where computer screens are used), and provide privacy for building occupants. BR 364 describes the most commonly-used solar shading devices and discusses new developments. It sets out the advantages and disadvantages of each kind of shading device and provides a decision table to help select the best solution. The 56 page report will be of particular interest to architects, building services engineers, building owners, facilities managers, shading manufacturers, retailers and installers in the UK and other countries with similar climates and latitudes.